Last weekend I was in between showings with some clients and decided to stop home for a quick lunch. While driving I was making a mental check of what we had and realized all the ingredients for that classic of classic sandwiches, the BLT, were sitting in the fridge. The only kink in my plan was the tomatoes were the small grape ones. Then, inspiration reared her beautiful head. I’d dice up everything, mix them all together and make BLT salad. Now, I am pretty sure this is not a new invention. In fact I’d be willing to bet this idea has been around for a while, but I’ve just never seen it. The closest bacon lettuce and tomato spin-off I’ve seen was a BLT dip (which was awesome) at a University of Maryland tailgate. Still, I was pretty excited to test out this new (to me) idea. 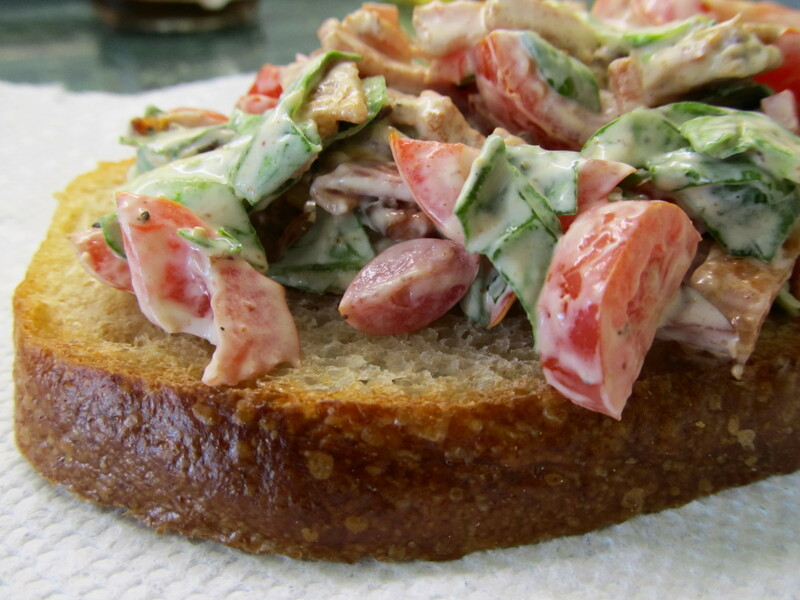 Making BLT salad is just as easy as you’d think. Fry some bacon, dice it, shred some lettuce, dice some tomatoes, add some mayo. Spread it on some toasted bread and you’ve got your classic Bacon Lettuce and Tomato sandwich with a twist. It makes a really good sandwich, and as a couple of my work colleagues noted (h/t Stephanie and Tara) you get the full flavor in every bite. No bites of just lettuce and tomato or bacon and lettuce, all three in every delicious mouthful. It’s a nice light sandwich as well. Perfect combination for when you’re overdosed on turkey next weekend! Fry up your bacon and set aside to cool and drain. Dice your tomatoes and shred your lettuce. Mix them together in a bowl. When the bacon has cooled, dice and add to the tomatoes and lettuce. Gently toss salad with 1-2 Tbs of mayonnaise. Taste. If it’s too dry add some more mayonnaise. Spoon equal amounts onto two slices of bread and top with the other two slices of toast. Enjoy! Previous Post The Best Thanksgiving Stuffing Ever! I love your twist on this sandwich.